Radnicki Kragujevac stayed in the fight to reach the Eurocup Eighthfinals in Last 32 Group N by thrashing Khimik Yuzhne 86-68 at home on Wednesday. 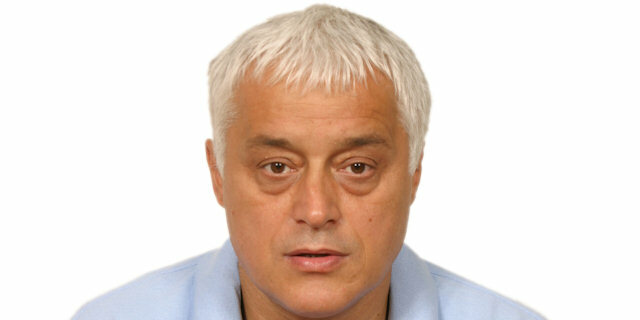 Radnicki joins Khimik and Strasbourg in a three-way tie for second place, all with a 2-3 record. Radnicki has the tie-break advantage against both Khimik and Strasbourg, so it will qualify if it wins. Khimik will only qualify if it wins and Group N champion Alba Berlin downs Radnicki. 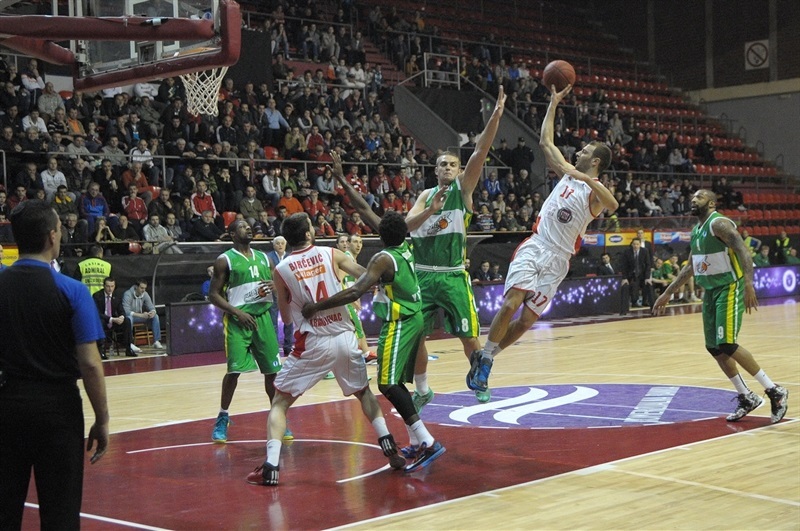 Stefan Bircevic paced the winners with 18 points and 8 rebounds. Marko Marinovic added 16 points and 13 assists, Sava Lesic had 15 points, Nikola Kalinic got 13 while Dusan Mladjan contributed 11 for Radnicki. Matt Gatens led Khimik with 18 points while Jamal Shuler added 14. Kalinic and Marinovic led a 9-2 opening run but Khimik quickly managed to get within 12-11 on a three-pointer by Jamal Shuler. Radnicki improved its defense while Bircevic, Kalinic and Marinovic led a 13-1 run that allowed the hosts to get a 25-14 lead after 10 minutes. Radnicki, led by Bircevic and Kalinic, boosted its margin to 39-24 midway through the second quarter and then again to 51-29 at halftime. Nothing changed from that moment, as Radnicki kept a safe lead and cruised to a well-deserved win. 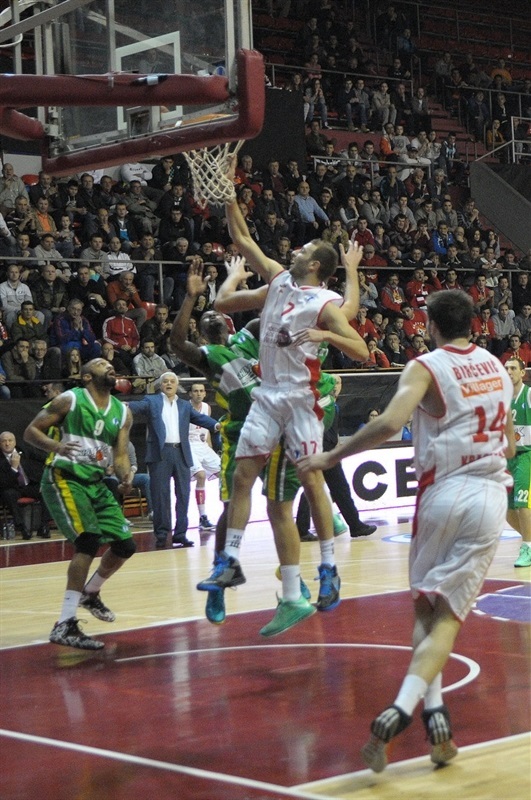 A three-pointer by Kalinic sparked a 9-2 opening run which Marinovic capped with a layup. Rolands Freimanis and Shuler tried to change things for Khimik, bringing their team within 12-11. Marinovic, Milos Dimic and Kalinic made free throws in an 8-0 run that gave Radnicki some fresh air at 20-11. Bircevic and Kalinic soon made it a double-digit game, 25-12, and a dunk by Paul Delaney brought Khimik within 25-14 after 10 minutes. Vitaliy Kovalenko made free throws and Delaney dunked again but Khimik only managed to trade baskets now. A layup by Dusan Mladjan and a jumper by an unstoppable Kalinic broke the game open, 33-19, midway through the second quarter. Matt Gatens struck from downtown and Freimanis scored again but three-pointers by Marinovic and Bircevic boosted Radnicki's lead to 39-24. Bircevic followed free throws with a couple of jumpers, getting help from Sava Lesic and Radenko Pilcevic to make it an 20-point game, 46-26. 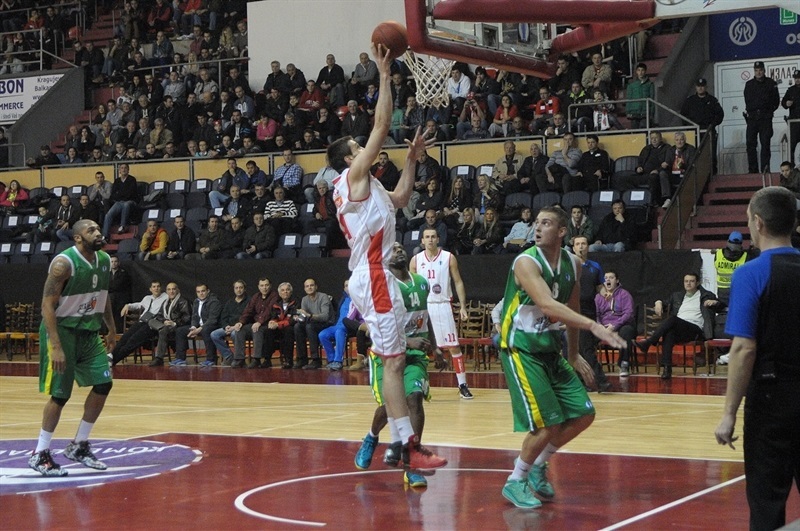 Kovalenko struck from downtown but Mladjan and Lesic gave Radnicki a 51-29 margin at halftime. Sergiy Popov and Shuler combined for all points in a 0-7 run that gave Khimik hope, 51-36, right after the break. 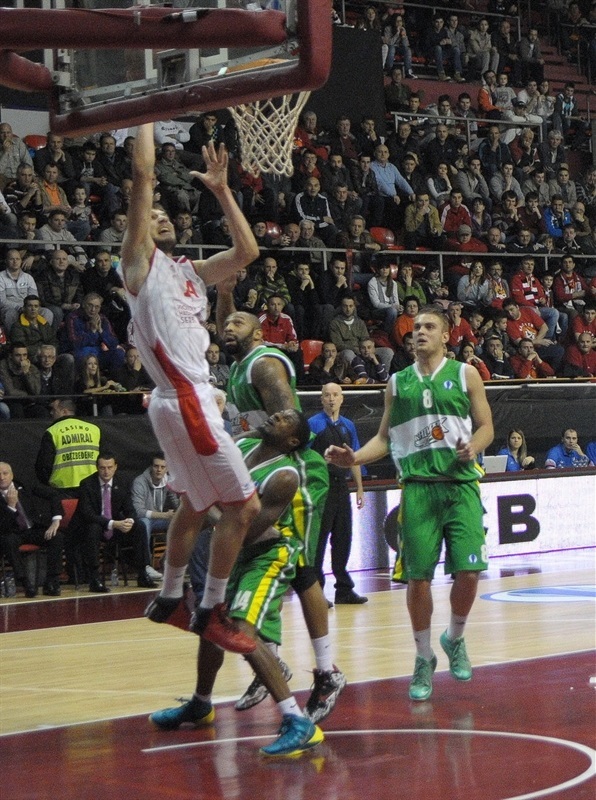 Lesic split free throws, Volodymyr Koliev hit a jumper but Bircevic and Marinovic kept Radnicki out of trouble, 56-38. Gatens and Shuler took over with back-to-back three-pointers but Marinovic answered from downtown and a jumper by Mladjan gave the hosts a 61-44 margin. Lesic kept going to the foul line often and a three-pointer by Mladjan ignited the crowd at 69-49. Lesic scored down low and a jumper by Shuler kept Khimik within 71-51 after 30 minutes. 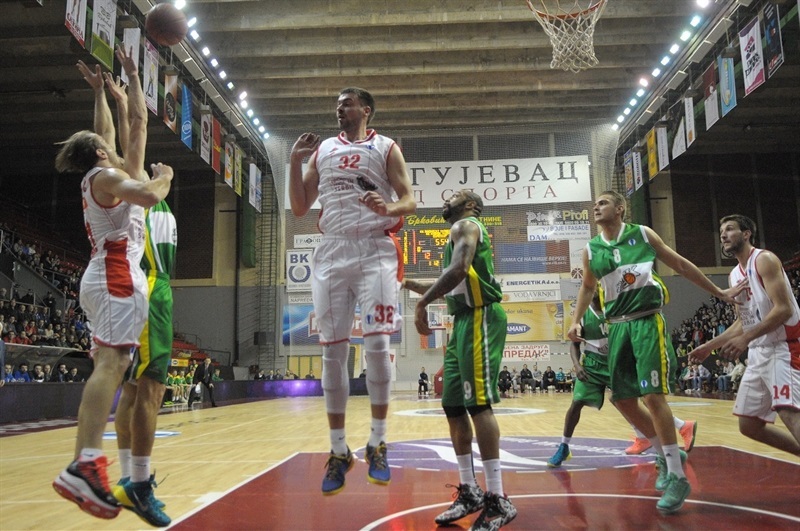 Romeo Travis and Kovalenko fueled a 0-6 run that brought the guests closer, 74-57. It didn't last long, however, as Bircevic, Lesic and Andreja Stevanovic allowed Radnicki to seal the outcome, 83-58, with more than 3 minutes remaining. Khimik kept trying but Radnicki had cruised to a well-deserved win that allows the hosts to hold their Eurocup destiny in their own hands. "I want to thank the crowd that is suporting us in the toughest moments for our club. We played a very good game, with a lot of energy, brains, assists and fight. All of that at once. If we would play like this all the time, we would have much better results this season. We are still with chances to go through in Eurocup, and we will go to Berlin to try to go through."